An iceberg roughly four times the size of Manhattan is making its way toward the Arctic Ocean after calving off Greenland’s Petermann Glacier earlier this month. 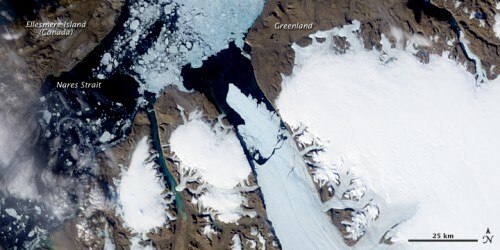 The 251-square kilometer (97-square mile) behemoth broke off the Petermann in northwestern Greenland on Aug. 5, causing the glacier to lose about one-quarter of its 70-kilometer (40-mile) floating ice shelf, according to NASA. It’s the largest Arctic iceberg to form since 1962. Researchers at the Byrd Polar Research Center at The Ohio State University said the chunk represents the largest single loss of ice ever recorded in Greenland. Jason Box, an associate professor of geography and atmospheric sciences, wrote that the glacier retreated 15 km (9 miles) in that one event, which represents a new known minimum for the glacier. Box and others studying the glacier have recorded its increasing disintegration since 2000. It’s retreated a total of 21 km (13 miles) in that time. The Aug. 5 break is three times larger than any previous ice loss in Greenland or elsewhere in the Arctic since at least 2000. “While it is unreasonable to pin an individual cracking event of a glacier on Global Warming, even if enormous, the retreat of Petermann glacier is most certainly part of a pattern of global warming,” Box wrote.